When I think back to what pieces of soundtrack music impressed me when I was a kid, these (among others) come to mind: Bernard Herrmann's score for North by Northwest (as well as his theme for the radio show Suspense), the solo organ arrangement of a bit of Saint-Saëns' "Le Rouet d'Omphale" that was used as the theme for the radio show The Shadow (best theme ever), Akira Ifukube's Godzilla themes, Laurie Johnson's music for The Avengers, Elmer Bernstein's music for Stripes and the thirty-seventh Soundtrack of the Week. 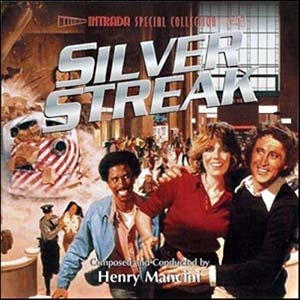 That's right, Silver Streak by Henry Mancini. Look, if I just wanted to be cool, there are several other Mancini scores I could go with here; Touch of Evil, for instance, or Peter Gunn or Mr. Lucky. It just so happens that I saw this movie (more than once) when it first came out and was haunted by the music. It's really about the main theme — rather similar to Nelson Riddle's Route 66 theme, isn't it? — and the love theme. They're both perfect and you hear them about a zillion times in the film. No wonder I can't forget them! As usual, Mancini has practically the entire A-list of session musicians working for him here: among others you'll hear Ann Stockton on harp, Shelly Manne on drums and guitarist Bob Bain, who contributes some impressive wailing wah-wah + distortion guitar here, à la John McLaughlin in the Miles Davis days. That's for the scene, you may remember, when Richard Pryor applies shoe polish to Gene Wilder's face, gets him some "threads" and a transistor radio, and … never mind. This Intrada Special Collection CD has almost 80 minutes of music on it, presenting the complete score in mono and some highlights in stereo.